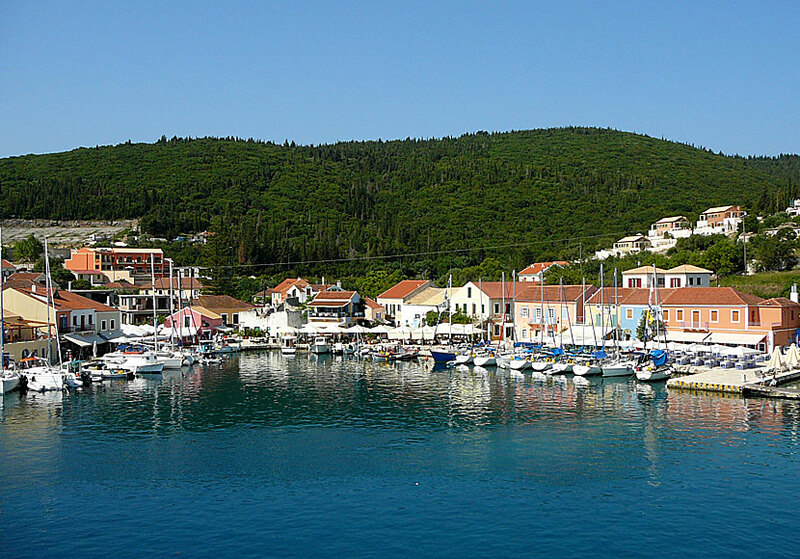 Fiskardo in Kefalonia. Restaurants. Accomodation. Sailing. Fiskardo, about 50 kilometres north of Argostoli, is the only village on Kefalonia that escaped undamaged from the earthquake. The village is almost intact, most of the old Venetian houses are still extant. When one see how nice it is in Fiskardo one curse the earthquake, this is how beautiful all the villages on Kefalonia could have been. Many think that Fiskardo is the island's most beautiful village, there are even those who think it is the whole archipelago's most beautiful village. 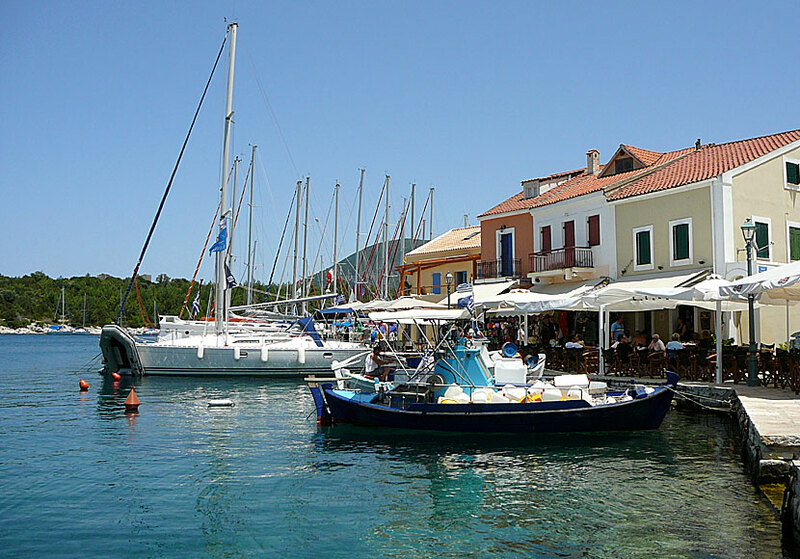 When I first came to Fiskardo, I did it by ferry from Lefkada, we were greeted by an adorable sight. One of my travelling companions said with a sigh: "This is the most beautiful spot I've seen in Greece". Fiskardo seen from the ferry to Lefkada. And it is from the sea that Fiskardo shows its best side. It is easy to get enchanted when the boat glides into the picturesque port filled with sailboats and fishing boats, in front of you is a long seductive promenade lined with pastel-coloured houses with red tiled roofs and on the hill behind the village grows a forest of green cypress trees. If you flew directly to Kefalonia, it is for that simple reason difficult to arrive by ferry from Lefkada as we did, but do not worry, there is a solution to the problem, there are several companies in the port that hire out small motorboats that you can chug around with, then you can take the opportunity to experience the beautiful approach of Fiskardo. The best beaches close to Fiskardo are Emblisi and Foki. Thanks to, or because of, its outward beauty, Fiskardo has gone from being an idyllic fishing village into a full-fledged jet set village. Fiskardo is visited by celebrities from all around the world, well, maybe not the whole world, but in any case from the Western World. Leonardo Di Caprio, Tom Hanks and George Bush Sr. are just some of the celebrities who have been here. The quaysides and bay outside tend to be full of expensive yachts. If you are going to sail here with a private yacht, you should arrive early to even find a place to moor. 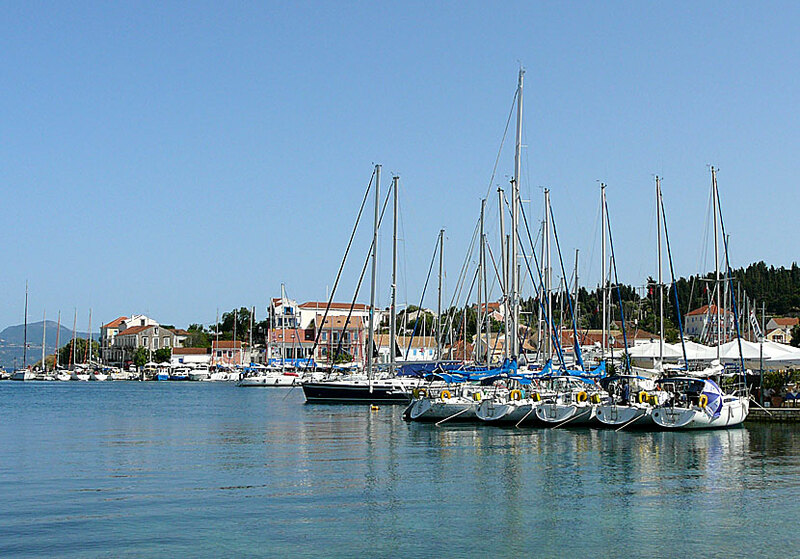 There are plenty of sailboats in Fiskardo. Celebrities usually mean the same as expensive. Fiskardo is no exception. The prices are among the highest I have experienced in Greece. But luckily there are exceptions. When we were here last we were going to eat Greek salad for lunch, the prices fluctuated between 8 € and 12 €. In other words it pays to compare prices. If you go by private vehicle to Fiskardo, you can choose between two distances. One that goes via Myrtos and Assos, and the other that goes via Agia Efimia. Most come via Assos, and if you choose that way, I can recommend you to drive the other road back. The road runs through a scenic landscape that offers incredibly beautiful views over the sea towards Ithaca. Along the way you pass several small villages that are not frequented by many tourists, some of them are extremely beautiful, including Neochori which is the last village before you reach Agia Efimia. 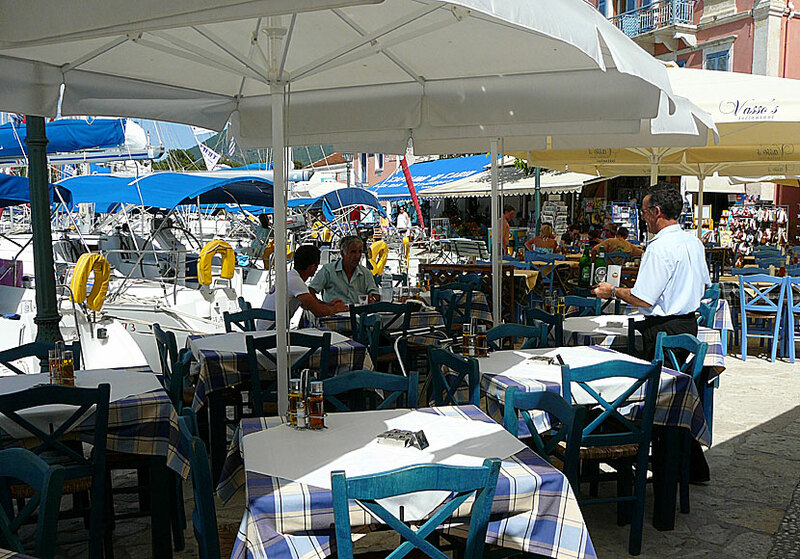 There is everything from luxury hotels to cosy family pensions in Fiskardo. Unfortunately I do not have any specific tips. There are about 25 different places to choose from on booking.com.